JCO wishes all our readers and followers a Happy Ganesh Chaturthi...May Ganpati blessings bring you lots of success in all your endeavours !! Beware, this recipe isn't meant to be quick and easy but the results will be more than satisfying !! You will get a lovely roasting aroma and slight change of colour when the flour is well roasted. After 40 minutes, add semolina and roast for 5 minutes more. Now add ghee and keep roasting both flour and ghee for 12-15 minutes on a very low heat, making sure there aren't any lumps formed. Switch off the heat. Add almond and saffron masala and sugar. Mix well, and let the mixture cool. Take little amount of mixture into your palm and roll into small balls. 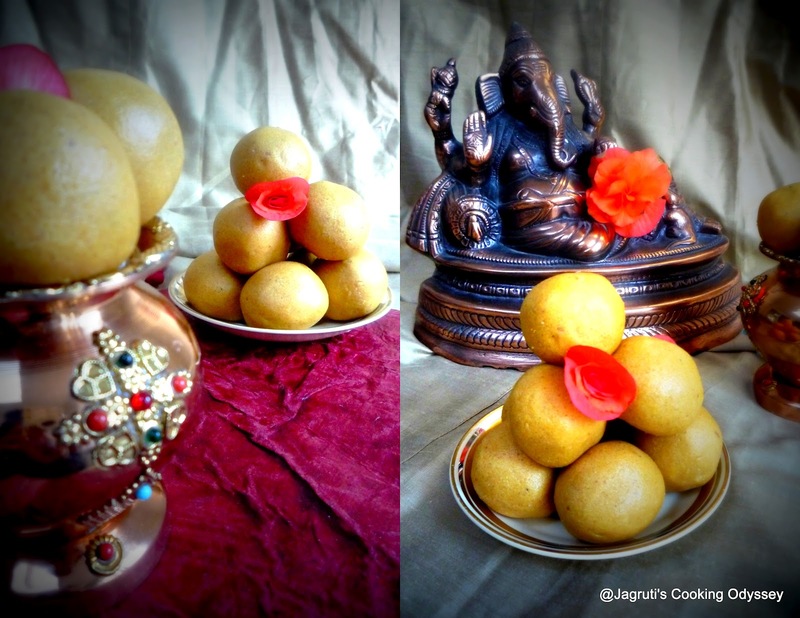 Perfect and scrumptious besan ladoos are ready to offer to Lord Ganesha. 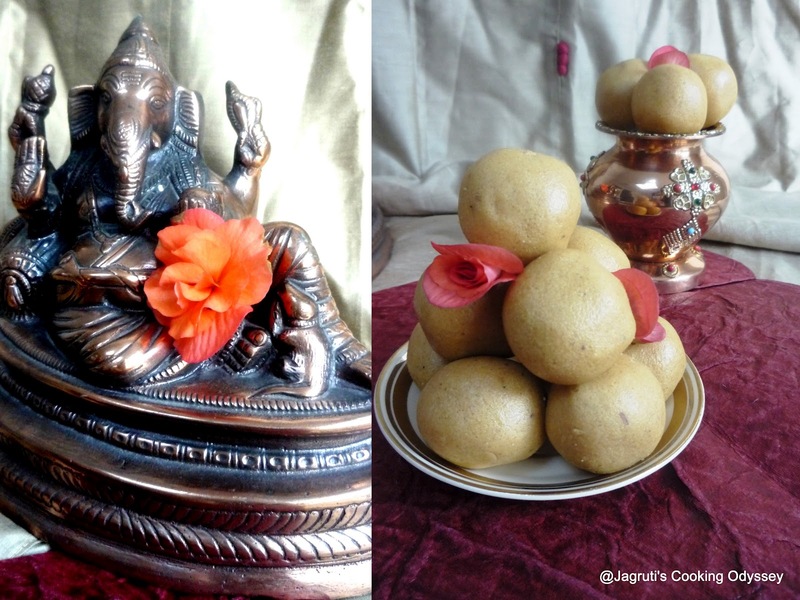 GANPATI BAPPA MORYA, AGLE BARAS TO JALDI AA," ("Father Ganpati, Next Year Come Again") O Ganpati Bapa Moriya – Farewell O Lord Ganpati! Once they are completely cooled, store them in airtight container for 4-5 days. Once again have a happy and safe Ganesh Chaturthi !!!!!!!!!!! looks absolutely delicious n very inviting!! Lovely pics!! Delicious ladoos. Happy Ganesh Chaturthi. lovely pictures! looks really good! Happy vinayagar chathurthi wishes to you too..Prefect looking cute ladoos. These look delicious and very pretty clicks too. Thanks mam for linking this yummy dish to MY FIRST EVENT AND GIVEAWAY-SHOW ME YOUR DESSERT.